To understand more about the EatWell Plate, and the guidelines, click the image above. A healthy meal starts with more fruits and vegetables and smaller portions of protein and grains. The EatWell Plate was developed by Bermuda’s Department of Health as a guide for building healthy meals. TAKE IT ONE STEP AT A TIME: Trying to make the change to a healthy diet doesn’t happen overnight. Plan to make small changes gradually, like substituting spices and herbs for salt, or use olive oil for cooking instead of butter or margarine. Vegetables and fruits are full of nutrients and may help to promote good health. 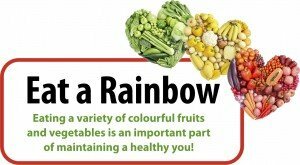 Include a “rainbow” of colourful fruits and vegetables in your diet every day! Choose protein foods, such as lean pork and beef, chicken, turkey, beans or tofu. Twice a week, make seafood the protein on your plate. Aim to make at least half your grains whole grains. Read the labels and look for the words “100% whole grain, or 100% whole wheat. Whole grains provide more nutrients and fiber than refined grains. Pair your meal with a cup of fat-free or low-fat milk. They provide the same amount of calcium and other nutrients as whole milk, but with less fat and calories. Skip the cheese sauce and gravy. Using heavy gravies or sauces will add fat and calories to an otherwise healthy meal. Savor your food. Eat slowly, and enjoy the tastes and textures. Remember, it can take 20-30 minutes for your body to signal you that you’ve eaten enough. Using a smaller plate at mealtimes helps with portion control. Eat at home more often so you know exactly what you are eating. When eating out, check nutrition information and try to choose healthier options such as baked instead of fried. Keep your food interesting by picking out foods you’ve never tried before. Have you ever eaten kohlrabi, quinoa, or edamame? How about ethnic foods? Try them! 10. Satisfy your sweet tooth in a healthy way. Indulge in nature’s bounty of sweet, delicious fruits. There are lots of healthy recipes for creative, light desserts online.